Get a clear view of the road ahead with Michelin RainForce Traditional Wiper Blades. 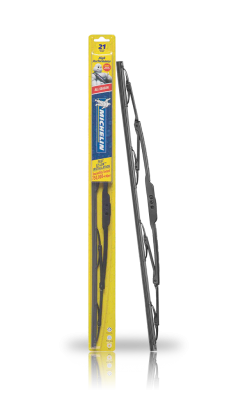 RainForce wiper blades offer streak free quiet wiping at an exceptional value featuring the EZ-Lok connector system for fast, quick & secure installation, a heavy-duty steel frame for added strength & durability and compression molded rubber for smooth quiet wipes. Durability tested to 750,000 wipes! 2226 - Michelin High Performance Wiper Blade 26" 2219 - Michelin High Performance Wiper Blade 19"